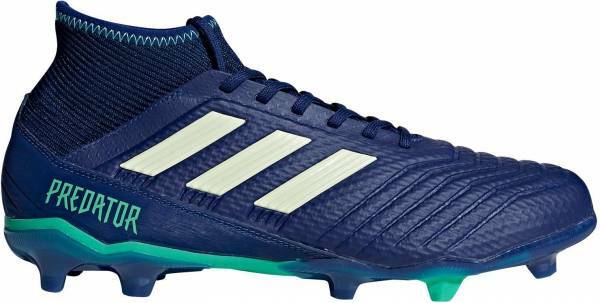 A majority of users reported that the Adidas Predator 18.3 Firm Ground football boot is comfortable to wear. This football boot model belongs to a budget-friendly price range. Many loved the aesthetics of this Predator model and some have commented that it looks expensive. Several players have concluded that the pair brings good value for money. A handful of reviews revealed that the Adidas Predator 18.3 FG football boot provides a good grip. One reviewer mentioned that the football cleat is easy to get on and off. Some chimed in that the pair does not give its wearers blisters or sore feet. A number of users praised this football boot’s durability. Another wearer commended how supportive the sock is without being too tight. A handful of reviews were not a fan of the Adidas Predator 18.3 FG shoe’s narrow fit. A couple of players said that the pair is about half or one full-size smaller as it has a narrow fit. One other player felt that the Adidas Predator 18.3 FG football boot did not feel secure around the heel area due to its sockliner. The Adidas Predator 18.3 FG football boot is hailed by the majority of its users for bringing a comfortable fit and fashionable look on the pitch. The fact that this is a take-down version does not stop the Three Stripes in ensuring quality especially with traction and stability on firm ground courts confirmed by a significant number of reviews. At $90, the quality of the boot is actually pretty good. At $80, you legitimately have a better option in the form of the Hypervenom Phelan 3, specifically the low cut version which would fall at the exact same $80 price point. Many cheered when the three stripes announced the comeback of the Adidas Predator silo. While the older models of the line focused on power, the new model including the Adidas Predator 18.3 Firm Ground football boot, is built to be thin and lightweight while maintaining ball control for the modern player. Taking a look at the specifications of this shoe starting with the mid top upper, this model makes use of a Primemesh material. This type of upper is engineered to hug the foot while delivering softness and great ball control at the same time. It also provides a sock-like fit. The soleplate is created with a Thermoplastic polyurethane (TPU)-injected based material that is a common feature among modern football boot models as it provides flexibility and stability. In addition, the stud configuration is engineered to maximize traction and rotation in firm ground courts through its hybrid stud tips. The Adidas Predator 18.3 FG football boot has a narrow but comfortable fit. Like this model’s 18.1 version as well as the Adidas Predator 19.1 FG shoe, a central lacing system integrated into the upper helps further the shoe’s fit. It is available in men’s sizes from 5.5 to 11. It is important to note that several customer reviews indicated that this model runs a half size to one size small so, it is recommended to check the football boot’s fit before purchasing a pair. Keeping up with the mesh upper trend, the comeback model of the Adidas Predator particularly the 18.3 FG version sports a Primemesh upper which promotes comfort and touch. The material is also designed for to lockdown the players foot creating a snug fitting boot. A central lacing system is made available to allow players to customize the fit. The outsole is created with a TPU-injected material that is designed to create stability for players on the pitch. Using geometric hybrid studs distributed throughout the soleplate, the stud pattern used optimizes turning and traction on firm ground courts. Several colorways are available for the Adidas Predator 18.3 FG football boot including cloud White/ Core Black/Real coral and Core black/ Utility Black.